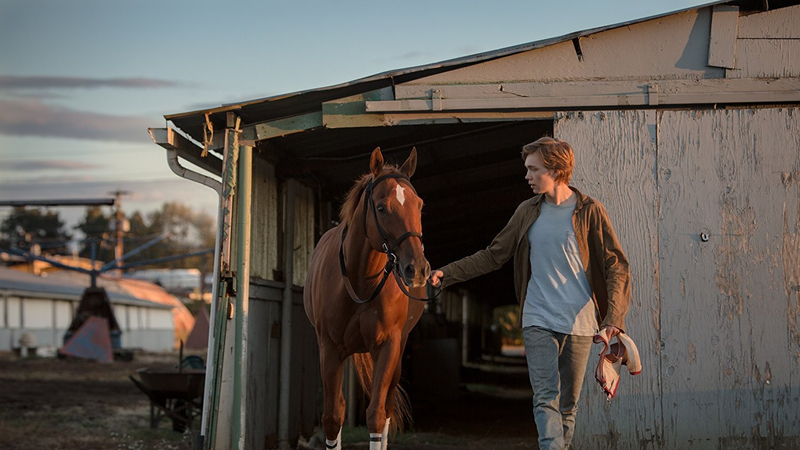 British director Andrew Haigh follows up the brilliant 45 Years and Weekend with another understated masterpiece, Lean on Pete, about a young man’s odyssey across America with his horse. Haigh demonstrates impressive versatility by moving from a drama about the collapsing marriage of a middle-class retired couple in genteel rural England, to one about a teenage boy trying to make ends meet in depressed, post-industrial America. Yet although they are worlds apart in terms of setting and subject matter, underlying both films is a deep understanding of humanity’s fundamental moral ambiguity. Soon after being introduced to Charley (Charlie Plummer), we learn that he lives alone with his single father Ray (Travis Fimmel) after his mother left home for good. Although it is clear that Ray isn’t the most reliable of dads – he often brings strange women back home, and there’s barely enough to eat – it’s also obvious how much he loves his son. Although just sixteen, Charley doesn’t appear to go to school, but instead jogs around town to let off steam, sometimes with a few dollars from Ray in his pocket. On one of these excursions, Charley comes across a horseracing track on the fringes of town, and after a chance encounter with horse owner Del (Steve Buscemi), is offered paid work taking care of and transporting the horses. Charley quickly develops a special bond with one horse in particular, Lean on Pete, and when his – and Pete’s – personal circumstances take a tragic turn for the worse, Charley flees town with Pete, hoping to track down his aunt in Wyoming. Despite what Lean on Pete’s premise might have you think, a heart-warming children’s tale this is not. Charley doesn’t succeed in turning Pete from limping underdog to unexpected champion, and neither does their journey into the rugged wilderness have an especially happy ending. Instead, Haigh uses the simple bond between a boy and his horse to share profound insights on the idealism of the young versus the cynicism of the old and – reminiscent of Bresson’s Au Hasard Balthazar – the purity of animals vis-à-vis man’s moral corruption. While Charley is constantly concerned about Pete’s wellbeing, worrying about him being overworked or injured, Del and his top rider Bonnie (Chloë Sevigny) warn him about getting too attached to the horse. As Bonnie sees it, horses are just tools to be exploited and then discarded – “They’re here to race, and nothing else” – and when Pete does later pick up an injury, Del insists he “would shoot him right now, if I could”. Yet despite their harsh rhetoric, both Del and Bonnie show real affection for Charley, and one suspects their cynicism is nothing but a shield raised in response to the pain and disappointment they have lived through. Indeed, the ability of damaged people to still act with kindness and compassion is a key theme throughout Lean on Pete, be it Charley’s father, the war veterans who provide him with nourishment and shelter on his journey, or the diner waitress who lets Charley off for stealing food instead of calling the police. That isn’t to say everyone treats Charley well – he also finds himself on the receiving ends of unjustified acts of violence and intimidation. But thanks to Haigh’s mastery, and a poised breakout performance from Plummer, a perfect balance is struck: neither falsely optimistic nor hopeless, Lean on Pete is a deeply humane film that is never anything less than believable.